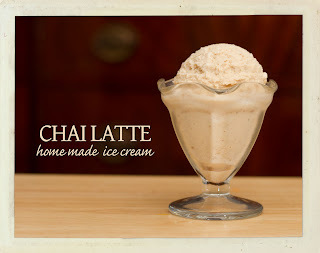 Karla Creative: Chai Latte Ice Cream - My Moment of Brilliance! A couple of weeks ago I had this fabulous idea to make ice cream and flavor it with chai latte mix. I finally got around to doing it today! When I mentioned the idea to my husband he told me that if he wasn't already married to me he would definitely marry me! I would say that was a sign I needed to make it! I was using a Cuisinart 1 1/2 Quart Ice Cream maker, if you use a different kind you may need to adjust the quantities of the ingredients! I heated the 1/2 cup of milk enough to dissolve the Chai Mix and then put it in the refrigerator to chill for about an hour. I then combined the sweetened condensed milk, the 1/2 cup milk/chai and the 2 cups of milk and mixed it well. I poured it into the Ice Cream maker and waited about 25 minutes and then we all enjoyed it's awesomeness! I put the extra into a freezer safe container and stuck it in the freezer. A couple of hours later I pulled it out and it still had a great texture, nice & creamy! The only thing I may do different next time is use half & half instead of the 2 cups of milk, it would make it even creamier! I am interested to know if anyone tries it! Also, feel free to Pin It! Photo by my fabulous husband and his camera that takes such great pictures!